World’s largest chameleon – world’s strangest creature? This could just be the strangest animal on the planet. With its swivelling gun-turret eyes, tong-like gripping feet and rapid-fire tongue, the chameleon has an appeal that’s all its own. This imposing portrait of a male Parson's chameleon at Paignton Zoo Environmental Park in Devon was taken by Zoo volunteer Cathy Oetegenn. The largest chameleon species in the world by weight, Parson's chameleon (Calumma parsonii) is found only in isolated pockets of humid forest in north and east Madagascar. It is listed on CITES Appendix II, which means trade in this species is regulated. 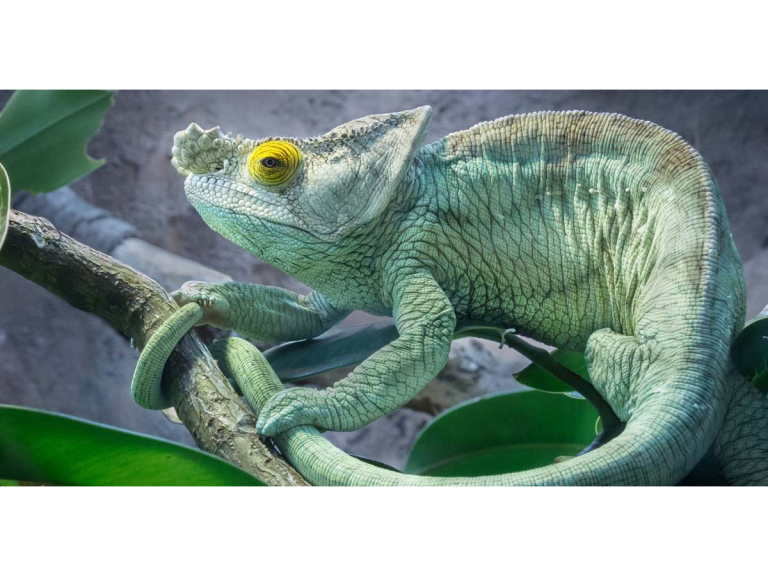 As with most chameleon species from Madagascar, it is illegal to export them. They are classified as Near Threatened by the International Union for the Conservation of Nature. Paignton Zoo’s pair can be seen in Reptile Tropics – though they are in separate enclosures, they have mated and keepers are hoping they will breed. But don’t get excited just yet; female Parson's chameleons lay as many as 50 eggs at a time – but they can take up to two years to hatch. The (hopefully expectant) female has no name, but revels in the number 13179, while the male goes by the catchy collection ID of 13178. They hatched in the same year – 2013 - and came into the collection at the same time, hence the consecutive numbers. The chameleon’s tongue - it can be longer than the animal’s own body - hits the prey in about 30 thousandths of a second. It is a common misconception that chameleons can change colour to match their surroundings. In fact, colour change is mostly subconscious and is affected by temperature, mood and light. Paignton Zoo Environmental Park is a registered charity. For more information go to www.paigntonzoo.org.uk or ring 01803 697500.